On other global issues, he said trade must be fair and reciprocal. No longer will the United States be taken advantage of by those who abuse its openness by dumping exports, subsidizing industries and manipulating their currencies. Many Member States will agree that the world trading system is in dire need of change, he said, affirming that the United States trade imbalance with China cannot be tolerated. On human rights, he said the United States will not return to the Human Rights Council until real reforms are enacted. Nor will the United States support or recognize the International Criminal Court, which has no jurisdiction, legitimacy or authority. He called on the member States of the Organization of the Petroleum Exporting Countries to lower oil prices and spend more on defence, and warned that Germany will depend entirely on Russian energy if it fails to change course. 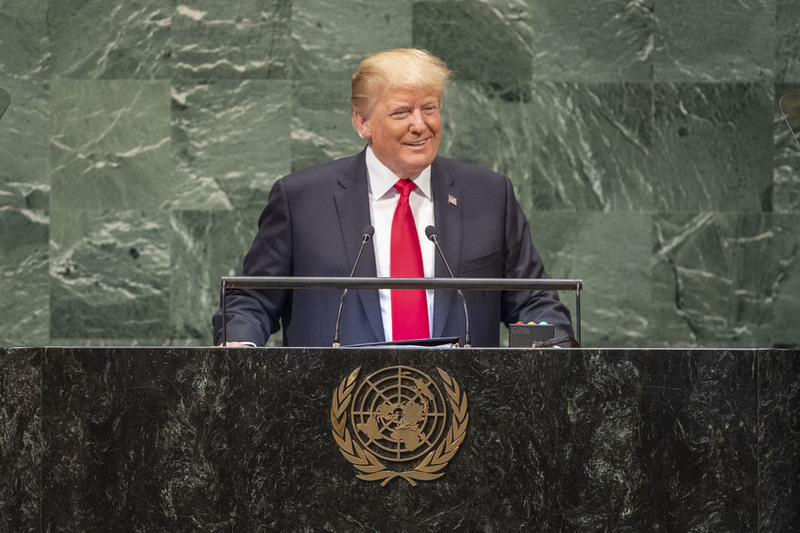 Reaffirming the rejection by the United States of outside interference in the Western hemisphere, he underscored its cooperation with Latin American partners on migration. However, the United States will not participate in the Global Compact for Safe, Orderly and Regular Migration. Migration should not be governed by an international body unaccountable to citizens. The only long-term solution to the migration crisis is to help people build more hopeful futures in their own countries — to “make their countries great again”.